A group of Call of Juarez veterans have realised they’ve been approaching cowboys from completely the wrong perspective. They’ve been looking through the practiced squint of John Wayne in first-person, when they should’ve been watching ol’ wide-shoulders from above: commanding him to flip tables and expend all his action points opening saloon doors far too vigorously. That’s Hard West: a sun-baked meeting of XCOM and Heroes of Might and Magic, inspired by Stephen King and David Lynch. CreativeForge Games’ pitch makes instant, obvious sense: Old Western shootouts are over in seconds, but stretched out over minutes for maximum tension. In short, they’re perfect turn-based battles. In Hard West, those battles are about “well-calculated risk”: no gunner can take more than one or two bullets, and consequently the right shot threatens to finish the fight in any turn. Making that shot is a matter of taking advantage of curving trajectories and ricochet opportunities. The game steps out from under the hat of XCOM with a unique sun mechanic. Outside the saloon, the light can be blinding, and long shadows can give away the position of enemies – or just as easily conceal canny cowboys. 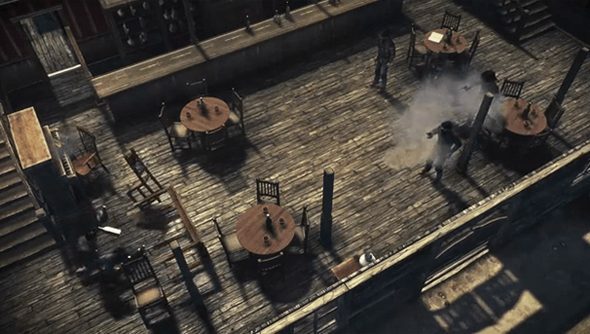 At the top level, Hard West is structured around a Heroes of Might and Magic-ish overworld map – using which players will travel, trade, collect and complete quests. Where the game threatens to fray at the edges is in its “sinister” supernaturalism. Increasingly, events in the world will take a turn for the overtly bloody and terrifying, and players aren’t to know whether they’re real or not. That mythic side of the Old West is the element I’m not so sure about – but then, the turn-based tactical genre has always balanced its dryness with a dollop of pulp. The original X-Com had mullets, let us not forget. The team already have a mystery RTS to their name – but its publisher has decided to postpone release until the market suits, and CreativeForge have been left to sit on their hands and watch their savings trickle away. Their $70,000 CAD target will kick Hard West into full production, and convince Polish outfit PlayWay to stump up for the rest. So, whaddya say? Is this market big enough for more turn-based tactics?